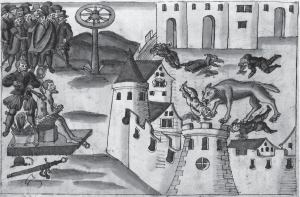 I’ll cover shape shifters and lycanthropes from the Norse berserkers to the witches of the early renaissance, (mostly concentrating on European) to modern interpretations in media, gaming, and magickal theory and practice. What do these accounts have in common, and what does modern shamanic practice show us about these legends? This entry was posted in Saturdays Classes and tagged Berserkers, Borrowing, gaming, Lycanthropes, Magick, media, movies, shaman, Skinwalkers, Tchipakkan, Therians, trance, werewolves, witches.